Agios Nikolaos is the capital of Lasithi prefecture. Visit the Voulismeni lagoon in the center of the town, the marina, the picturesque streets and seafront shops-tavernas in town. 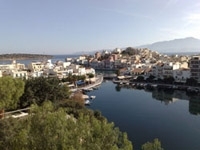 Agios Nikolaos offers a marina, port, bus station and two airports nearby.